"A sci-fi epic that does something rare in an age of endless adaptations and reboots: lives up to its potential while leaving you wanting more." "Rodriguez proves he's still a near-unmatched visual storyteller." "The results are what one might expect from two nerd gods of filmmaking: a visually stunning computer-generated heroine, impressive futuristic world-building, and some seriously neat action scenes." 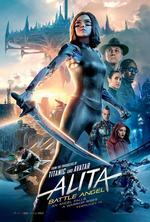 "Watching ALITA BATTLE ANGEL the eye-popping, groundbreaking, visually dazzling stunner from Robert Rodriguez and James Cameron, you can feel the ground beneath you shifting."